Detail : George's fourteenth solo single. 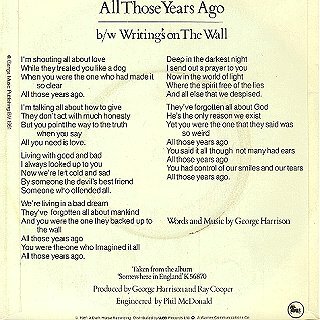 This track was George's tribute to John, and was released to promote the forthcoming Album, "Somewhere In England". It became his first top 30 hit for eight years. George originally wrote this song for Ringo and at that time it had different lyrics, but Ringo decided against using the finished article. After John's murder George re-wrote the words and recorded his own vocal take on top of the original backing track which featured Ringo. Later Paul and Linda dropped into George's studio and recorded additional backing vocals. 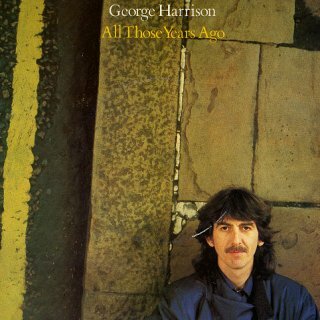 Therefore, "All Those Years Ago" is the first post-Beatles song to feature Paul, George and Ringo (although they were NOT in the studio at the same time). The record came in a picture sleeve with the lyrics printed on the rear. The cover is the same as that used for the album it promotes, being taken by Caroline Irwin. It shows George sitting in front of "Holland Park Avenue Study", which is a three dimensional artwork by Mark Boyle made in 1967. At the time of the shot, the picture was housed in the Tate Gallery in London.